Already finished with the massive open world of Assassin’s Creed IV: Black Flag and craving some high-seas pirate action? Fear not, swashbucklers – the game’s first single-player DLC, Freedom Cry, releases this week. The content releases Tuesday for Xbox 360, Xbox One and Microsoft PC; PlayStation 3 and PlayStation 4 players can get the content Wednesday. The content is part of Black Flag’s season pass, so players who’ve already purchased that can access it at no extra charge. 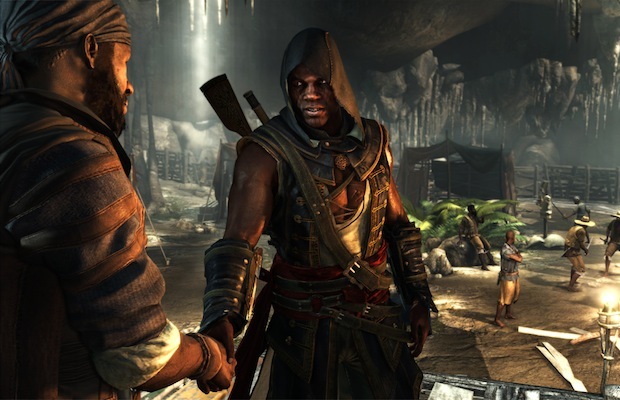 Freedom Cry takes place 15 years after the events of Black Flag, putting players in the shoes of protagonist Edward Kenway’s first mate, Adewale. Now a full-fledged Assassin in his own right, Adewale finds himself shipwrecked in Saint-Dominigue, setting off on his own adventure. How the franchise’s meta-game – which in Black Flag saw players take control of a nameless employee of the fictional company Abstergo Entertainment – will fit into the content, if at all, remains to be seen. Freedom Cry features nine new missions telling a self-contained story starring the former slave. The content promises to take players to new locations as well as hint at settings for future installments in the Assassin’s Creed franchise; the next full-fledged entry, still officially unannounced, is being developed by Ubisofts Montreal and Toronto. Do you plan to pick up Freedom Cry when it releases this week? Why or why not? Let us know in the comments.